Fly Fishing spring creeks in Wisconsin’s Driftless Area can be an intimidating experience. Skinny water can be very unforgiving to the beginning fly angler. Complex hatches, selective fish and high angling pressure are all factors the fly angler must overcome to have a productive, enjoyable day on the water. Our spring creek class will focus on various presentation methods to make you a confident, versatile angler. 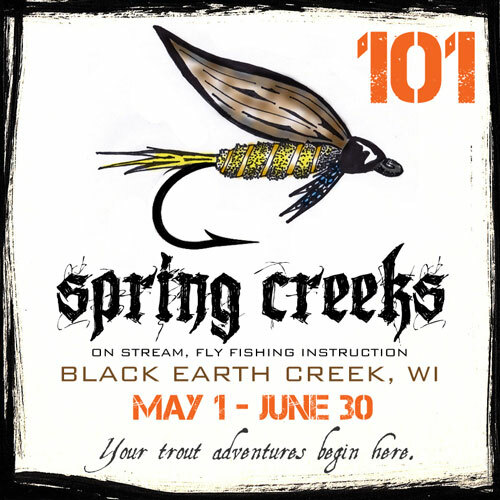 From prospecting with a team of wet flies to targeting rising fish with a dry fly, our one day class will expand your arsenal of tactics to fish Driftless Area streams with success. How to read the water and identify holding lies, structure and feeding lanes. Casting instruction, line manipulation; mending and streamer control. Rods, flies, sink tips and leader material will all be provided. You can bring your own rod(s) – an 8 to 9-foot, 4-6 wt single hand rod is recommended. Classes are held on Black Earth Creek, in Cross Plains, WI — which provides various access points, water types and consistent hatches.